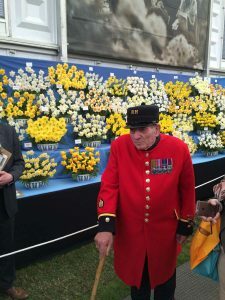 It’s that time of year again when the Walkers team here at Taylors Bulbs start to get nervous ahead of the RHS Chelsea Flower Show (23rd – 27th May). And with particularly good reason after winning our 23rd consecutive Chelsea Gold in 2016. 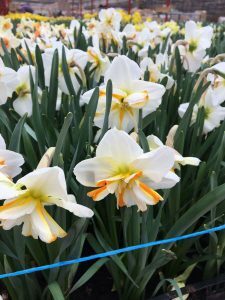 The pressure is certainly on and as always, each year brings its own unique and specific challenges when trying to get over 80 Narcissus varieties to all bloom simultaneously, out of season and with 100% flawless flowers! How do we get Narcissus to flower all together at the end of May? The daffodils we exhibit at Chelsea are planted just after Christmas and are kept temperature controlled. With four weeks to go until the big event, the bulbs are moved into the greenhouse. 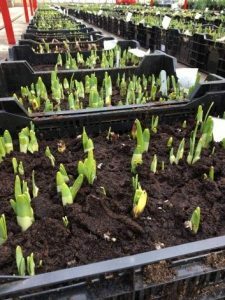 During the first week in the greenhouse the daffodils start leaf growth and from then on the flowers begin to form. Ten days before the show the flowers are cropped fully open, they are then kept in a cold store, where they are checked twice a day. Once the Daffodils are taken to Chelsea they only have a few days in the floral pavilion before they are past their best. To keep the high standard of blooms throughout the show the display is re staged at least twice over the duration of the event. Sounds easy doesn’t it….but it is no mean feat when you consider that the display will consist of 2500 flowers picked from 15000 blooms of 86 varieties. These are mostly flowering far later than nature would intend especially with varieties such as February Gold which as the name suggests normally flowers in the garden in early February. So with just a few weeks to go, the team are putting long hours in, with their keenest eye and attention to detail to make sure we achieve the highest standards that visitors have become accustomed to. And the culmination of all our efforts will be early in the morning on Tuesday 23rd May when we arrive on our stand to see if we have won another Chelsea Gold. Look out for updates on our website and across Twitter, Facebook, Instagram and Google+ and of course if you are lucky enough to have a ticket for the show then please come and see our display in the Grand Pavilion, stand B110.